Cameron and Brooklyn Conner are so well versed in geography that they take in GIS concepts in their California home before they go to school. 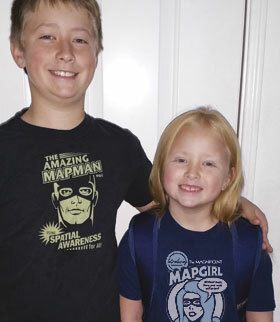 The siblings, in fourth and second grades, respectively, get help from their Esri T-shirts—and their GIS librarian mom, of course. 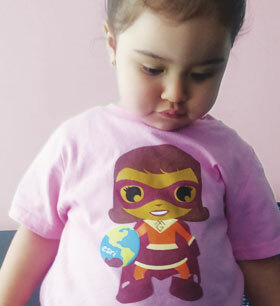 In Bogotá, Colombia, 19-month-old Victoria contemplates what being Map Girl actually entails. Thanks to her dad, solutions engineer Deiro Gonzalez, she’s already learning! 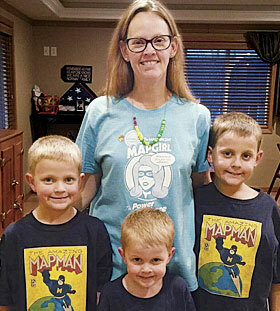 Heidi Jerke and her three boys get ready for GIS Day at their school in South Dakota. The Minnehaha County GIS coordinator has already taught her kids a lot about mapping, and they love teaching their friends all about GIS. This year, GIS Day falls on November 16. Visit gisday.com to find activities near you—and even get inspired to put on your own event.